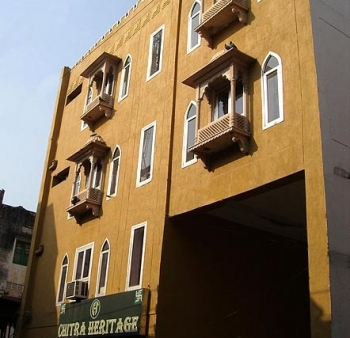 Hotel Chitra Heritage, located in the queen of holy cities - Haridwar, with culture and ambience of Haridwar, located at the bank of River Ganges. Its graceful architecture that fits in perfectly with the lovely backdrop of the hills and the greenery all around flows wonderfully into the interiors, ensuring comfort, service and relaxation to our customers. The hotel is located in the heart of city Haridwar, which welcomes its guest to experience an artful balance of contemporary elegance and modern design. Walking distance from Railway Station and Bus stand, the hotel is situated to near to Haridwar best-known attractions including Har-ki-Pauri, Mansa Devi, Shanti Kunj, Chandi Devi, Bharat Mata Mandir, Pawan Dham and many other. 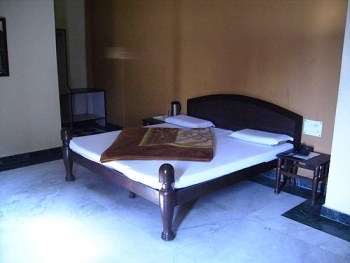 The rooms of the Hotel Chitra Heritage have elegant and stylist decor. Classy furniture with all modern facilities is provided for your luxury and comforts. The hotel offers excellent facilities and high standard comfort for leisure and business travelers with exquisitely designed 26 guestrooms, with easy access to all the parts of city committed to best personalized hospitalities at very affordable price. There are 5 standard, 7 deluxe, 9 executive, 3 deluxe four bedded and 2 deluxe three bedded rooms in the hotel. At Hotel Chitra we take pride of a well-built in-house kitchen that provides our guests with absolutely superior quality food. Our Hotel specializes in preparing all sorts of delicious vegetarian dishes. We also offer various types of Continental dishes, Chinese dishes, and almost all types of Indian dishes. Air : Jolly Grant Airport in Dehradun is 35 kms from Haridwar Hotel Chitra Heritage. You can get plenty of taxi to reach Haridwar. The airport is 35 kms from the hotel. Rail : Haridwar has been well connected by trains to all the major towns of India. Road : Haridwar, on the main highway, is connected to all major centers in the region and other parts of the country by road. There are buses available from Delhi to this place. Rishikesh is 24 kms, Mussoorie is 90 kms and Dehradun is 41 kms from Haridwar.